When we think about mental health the temptation, somewhat oddly you might think, is to think about mental illness, and we hear the statistics about how 1 in 6 of the adult population is suffering from a diagnosable mental illness at any one time, and 1 in 4 of us will do so in any year. What this year’s theme is doing is reinforcing the message that we all have a state of mental health, good or bad, surviving or thriving, and that the most relevant statistic when we think about mental health should be 1 in 1. For me, as I am sure is the case for many people who have suffered mental illness, the theme reminds me only too clearly of the weeks and months when just surviving felt like a huge achievement in itself. I have particularly in mind an appointment with my GP in which she asked me how I had been feeling and the most I could give her in reply was that “I am still here, and that’s good enough for now”. But you do not need to have confronted suicide to recognise how our state of mental health changes over time. Just as we all (I hope) can recall, and may be experiencing right now, times when we felt on top of the world, when we were happy, fulfilled, feeling strong and engaged, so we all too will recall times when we felt none of these, when we felt isolated, scared, weak and unsure. The starting point is having the self respect and self care to notice how we are, to take time out to check in on ourselves. And something most people could do with a bit more of is to know what we should be looking out for in our state of mental health. What are the warning signs that might indicate that we are moving away from a point of thriving and are in fact beginning to struggle? To use an analogy with cancer, we know we need to check our bodies on a regular basis, and to seek advice if we notice strange lumps. What are the lumps of mental health? Sadly it is not something we get taught about in school and is unlikely to be something our parents talked to us about. “How are you?” is a question that gets asked countless times a day. Most of the time we play the game and give the “fine” response that is expected. Sometimes we really should stop to consider our answer, and be honest, even if just to ourselves. How am I? Am I thriving or just surviving, or somewhere in between? 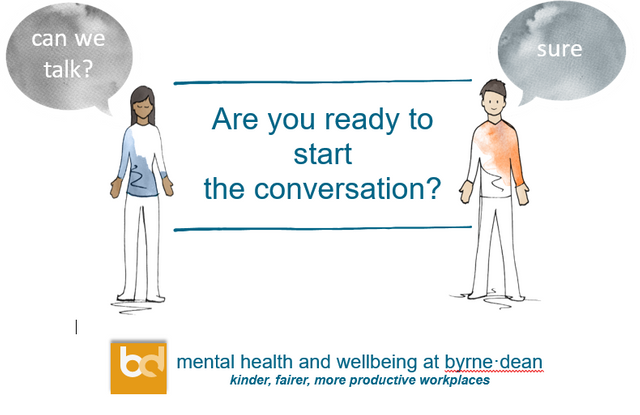 byrne·dean provides a range of mental health training and support. To find out more click what we do or email enquiries@byrnedean.com, or have a look at this short film.